Use the Chocomatic to design candy bars made out of chocolate squares. Use multiplication to find the number of squares in each chocolate bar. 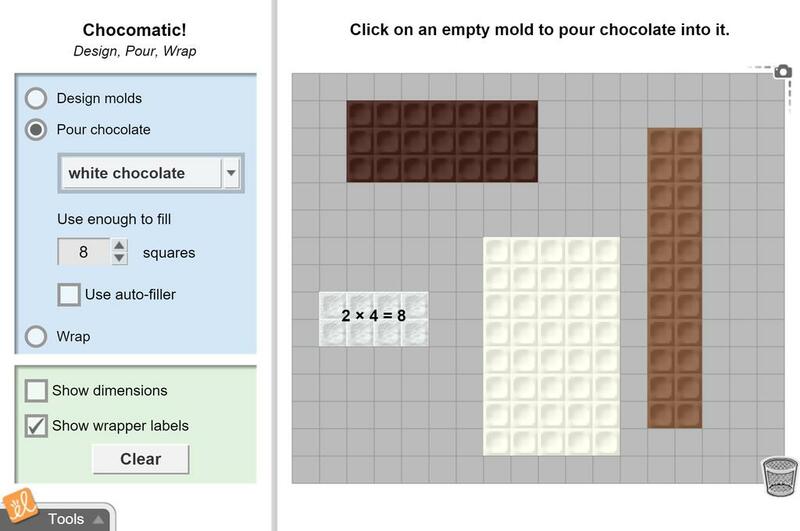 Build collections of chocolate bars that all have the same number of squares. Solve multiplication problems by joining two smaller chocolate bars into a large bar. Draw an array for a given multiplication expression. Find the number of squares in an array using repeated addition and/or multiplication. Find the factors of a given number. Use arrays to write a given multiplication expression as the sum of two multiplication expressions. This Gizmo is great to help review arrays and area. Great program to demonstrate arrays in a whole class setting! Love showing distributive property with this! Try asking your students to show you all the different ways to find 8 x 9! great gizmo for area! very useful! Mostly used for reviewing area. Very useful and engaging for students.